A name Arthur Bend is found on the Bottesford ‘church list’ of WW1 Servicemen. However, this could refer to either of two men, Arthur Bend and Arthur William Bend, both of whom lived in Bottesford in the years before WW1. This page provides biographic notes regarding Arthur Bend, born in 1877, son of John and Mary Ann Bend, who served as a Captain in the Royal Engineers. Information for Arthur William Bend is given in a separate page. Arthur Bend was born in Normanton on the 27th April, 1877, son of John Duffin Bend and Harriett Bend, nee Reynolds, who came from Whitwell, Derbyshire. He was baptised on the 7th October 1877 at Bottesford. In 1881 and 1891 the family lived on Belvoir Road, Bottesford, where John worked as a bricklayer and stonemason. In 1881 there were two children, Edith (4) and Arthur (3), and by 1891 a third, Frederick (born c.1886), was also at home. By this date, Edith was described as a monitress at the village National School, and Arthur as a monitor. 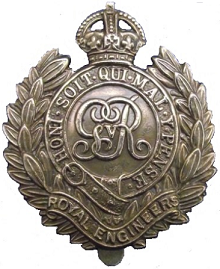 Arthur Bend served in the Royal Engineers, and achieved the rank of Captain, as confirmed by James Cole, his great grandson. 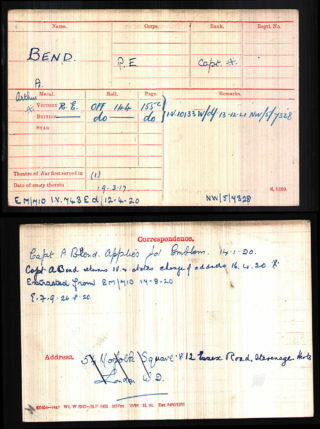 His Medal Index Card indicates that he was awarded the Victory and British War Medals, and also that when he enlisted his home address was 54 Norfolk Square, London W2, but had later moved to 12 Essex Road, Stevenage, Middlesex. Arthur and Catherine had four children. After Edith Nora (born 1900) there were Mildred Elizabeth (b.1901), Frederick Wilfred (b.1903) and Vera Kathleen (b.1910). Electoral rolls indicate that Arthur and Catherine remained at 12 Essex Rd, Stevenage, until 1922 when they moved to 54 Hamilton Crescent, Southgate, Middlesex, where they stayed at least until 1926. Catherine Bend died in Edmonton, Middlesex, in 1930, aged 56, and was buried back at Thurnby on the 4th April. Arthur Bend died just two years later, in 1932, aged 55. His address at this time was The Cottage, Clivedon Mead, Maidenhead, Berks. He left 3 daughters and 1 son, and probate records show that his estate was valued at £1156 3s 10d. Arthur William Bend’s brother, Frederick Richard Bend, died 26th December 1957 in London, at 99, Camden Street. Born on the 5th August, 1885, he married Ellen Kate Marshall at Bottesford on the 9th June, 1910, and the couple lived at 7 Easthorpe Road, Bottesford. Frederick worked as a railway clerk. He may well have served in the forces in WW1, but no military records for him have been located, and his name does not appear on the Bottesford ‘church list’ of WW1 servicemen. Bill Pinfold adds that Frederick Richard Bend served in the Observer Corps in 1939 immediately before WW2, as indicated by his entry in the 1939 National Register, and presumably continued in this role during the war itself. One of the executors for Frederick Richard Bend looks to have been his cousin Cecil James Bend, a younger brother of Charles Albert Bend who was awarded the Military Medal while fighting with the Canadian Expeditionary Force. Cecil and Charles were both sons of Reuben and Mary Bend, so they were all grandchildren of William and Hannah Bend. Bill also adds that Frederick and Ellen’s son Frederick Kenneth Bend, born 1916, was killed in WW2 at the 2nd battle of El Alamein: there is a death record, a CWGC record and a probate record which shows that his father was his executor. Perhaps he was their only child. He was mentioned briefly in an article in the Grantham Journal of the 16th November, 1945, p7, in an article about an ex PoW’s gift to Bottesford. Regrettably, this page was prepared too late for Arthur Bend to be included in the Bottesford and Muston First World War Roll of Honour prepared for the Armistice Commemoration in 2018.